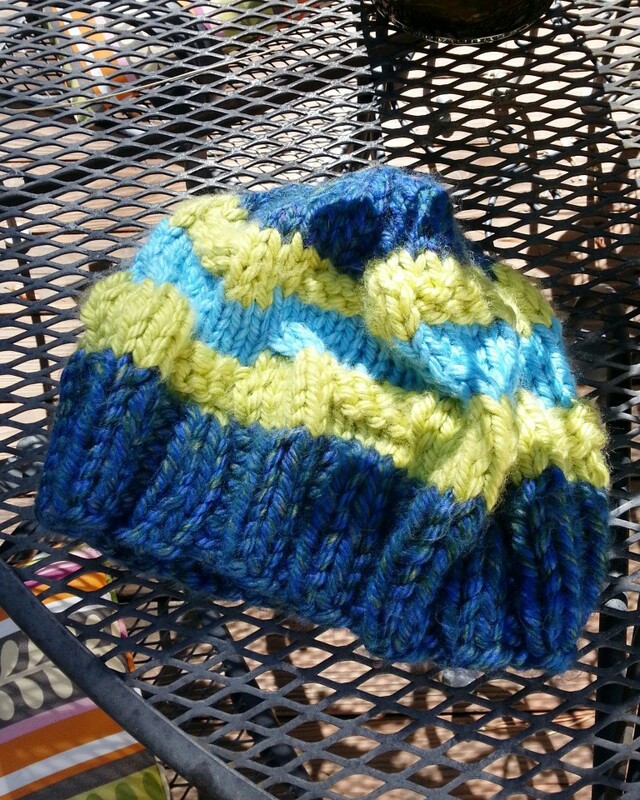 One of the hats I made to sell this crafts fair season. 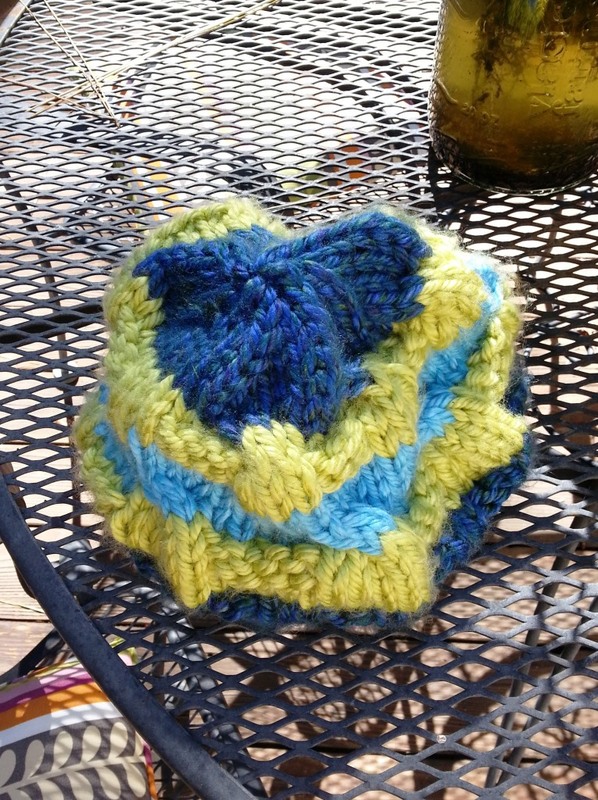 Easy to knit up and comes in toddler, child and adult sizes. The colors I used reminded me of the leaden skies and snow that we get in the Sierra Nevada Mountain Range. You ever spend way too much time on the wrong project with the wrong yarn at the wrong time of year? Welcome to the last several weeks of my crafting! I have been fighting this thing since the beginning. Several weeks ago I put out an impassioned request for some ideas on how to use the linen stitch. 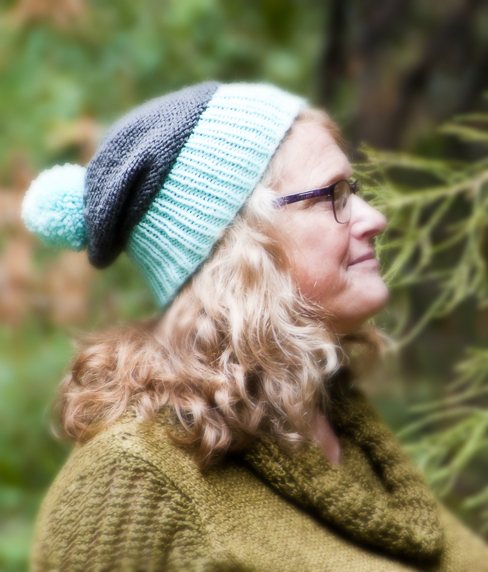 I rattled off a list of items I didn’t want to make, which included a cowl, but as a proper linen stitch needs to be worked in the round, I was limited. So what did I do? I started a cowl. No big deal. Except I had to cast on 16 different times because I kept twisting the foundation row. That is such a rookie mistake, that I should have taken my cue from such an inauspicious start. The yarn is Malabrigo that I’ve had tucked away in a bag in my closet for over a year, and I wanted to use it. I even rescued a snarled skein that had previously kept me from using the yarn at all – that’s how bad I wanted to get this thing started! As for a pattern, I was loosely basing in on Kristen Kapur’s Chickadee Cowl, but not having too much success. The yarn combination was just wrong for me. So now it sits, rewound and back on its shelf in the closet, awaiting a more suitable project. Doing the Eye of Partridge stitch for the heel and loving it. In the meantime, I figure it’s never a wrong time to work on socks! See you in the funny pages. All right, you guys: fess up. 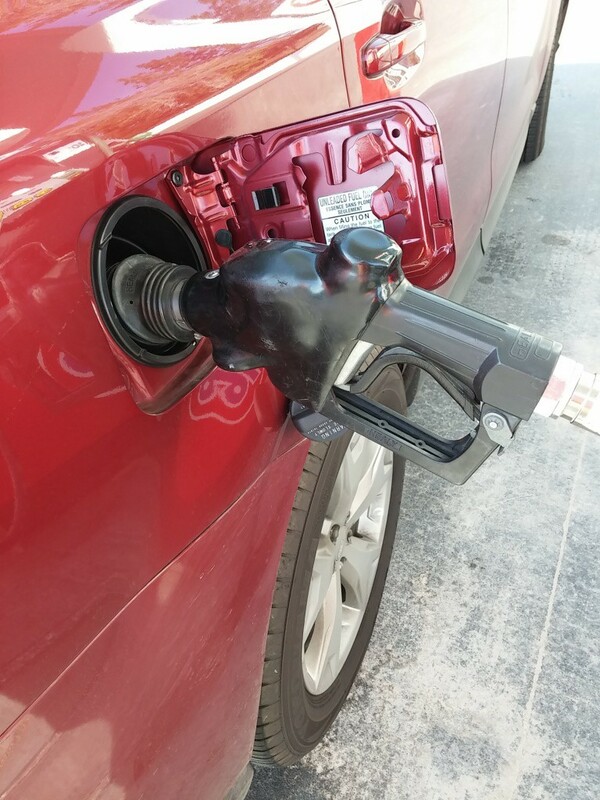 I am not the only regular, non-whiffing human who really enjoys that first sniff of gasoline when it’s being pumped into the tank. You know, that first little hint, and then it become overpowering and you’re done. I’ve told others of this, and I’m always looked at askance, like, “Ahh…that explains it!” For all you smart asses out there, it’s not a recreational thing, I don’t huff/whiff/whatever, because it’s something I’ve honestly never thought of doing, even if it wasn’t illegal. Yuck. Even when I was a young hot-head looking to experiment with mind-altering…uh…experiences, this was never an option. Ever. And I cannot be the only one who has this olfactory quirk. very particular circumstance, you do a, it equals b, not f or qx! As for what I’m stressing on, in my last post I said we had pulled out of escrow on one house because a house I really wanted had come back on the market. We were one of two bids on the house, and we didn’t have any contingencies, they did, and we were waiting to hear back from our realtor. We were fairly confident that our bid would be the winning one and were mentally re-designing the kitchen, which colors the walls need to be painted and in general talking about what we’d need to do to make the house really slick and cool (you know,when you first move into a new house and you have all these great ideas, and only 10% of these go through as planned!) Imagine my surprise when the next day our realtor called to let us know that the other offer had been accepted, even though it was a lower bid, because they wrote a sob story about their children needing a home. Son of a b…well, you know. The owners of the house I’m currently renting are really cool. As a former home owner and landlord/lady/whatever, myself, I have always kept them abreast of what is going on, especially with the house hunt, because it’s a good thing. And not only that, Staci has some of the most photogenic children I know, and you’ve probably seen them modeling my stuff in earlier posts. She has been a sympathetic ear throughout the process, but she didn’t know that the amount we qualified for had been raised, because I didn’t think it was worth mentioning. So when she heard of my latest disappointment, she texted me back and said, “I wish you could just buy the house!” After several back and forths and all sorts of other stuff that would bore you, we are know in escrow to buy the house we’ve always wanted from the beginning, the one we’re already living in and loving. With our track record going here, I’m on pins and needles. I expect something to be too much, such as insurance. Homeowners insurance here is quite dear, because we’re right in the middle of the forest during one of the worst droughts in California history and summer brings a rash of forest fires that puts one on their toes during this time. This is included in our monthly payment. That’s what is worrying me. I have several insurance agents searching for a not so god-awful expensive policy. I am keeping my fingers crossed! Figuring out how long to make the ears and how to place them. rounds and then regretfully, putting it back in my yarn satchel. Yes, I have a yarn satchel for my WIPs, don’t you? Even though this is a relatively easy knit, because I’m making so many modifications to the original pattern, written by Cassidy Clark, it moves very slowly. 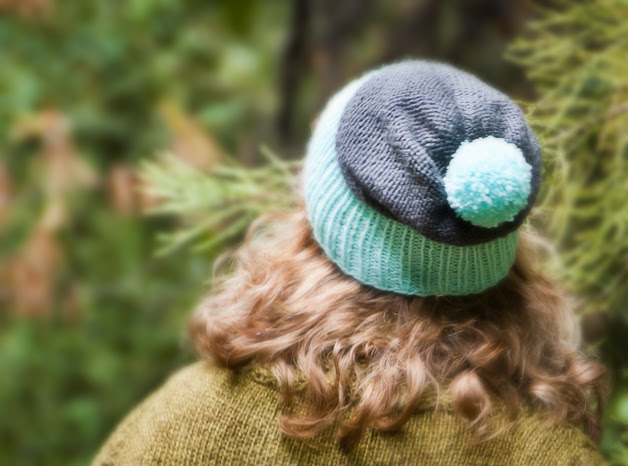 Backing up, doing knitting math, and seriously trying to envision what you’re going after. These take time. Hopefully, I will have a bunny wabbit that looks somewhat cuddly. See you in the funny pages! I Just Don’t Get Socks! I have started knitting another pair of socks. For those of you who have read any of my previous entries while I’ve been working on socks, you’re probably rolling your eyes. Why, Glenda? Why are you starting another pair? Because I want to learn socks! I’ve knit five pairs and used three different patterns in order to get a good fit, and possibly to understand the whole process. 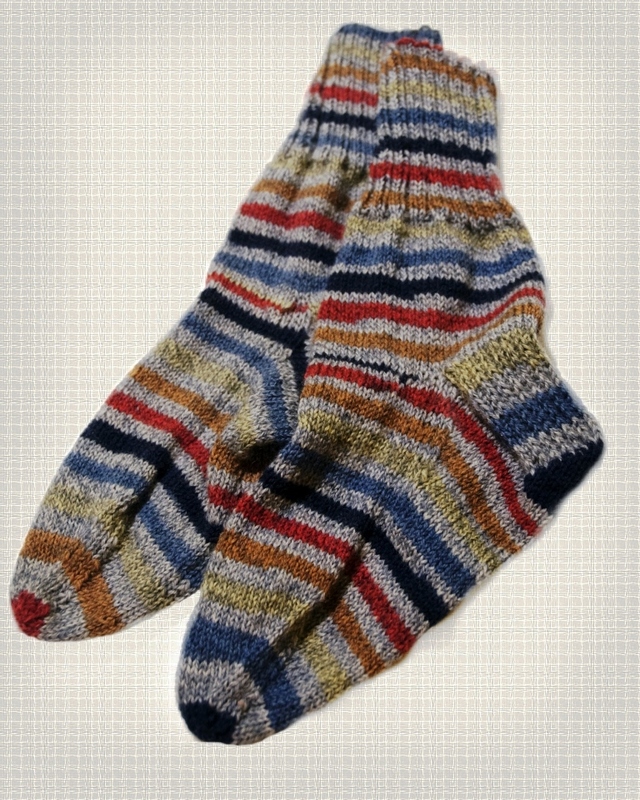 I recently purchased “Sock Knitting: Master Class” by Ann Budd and intend to use that…after I finish these socks! 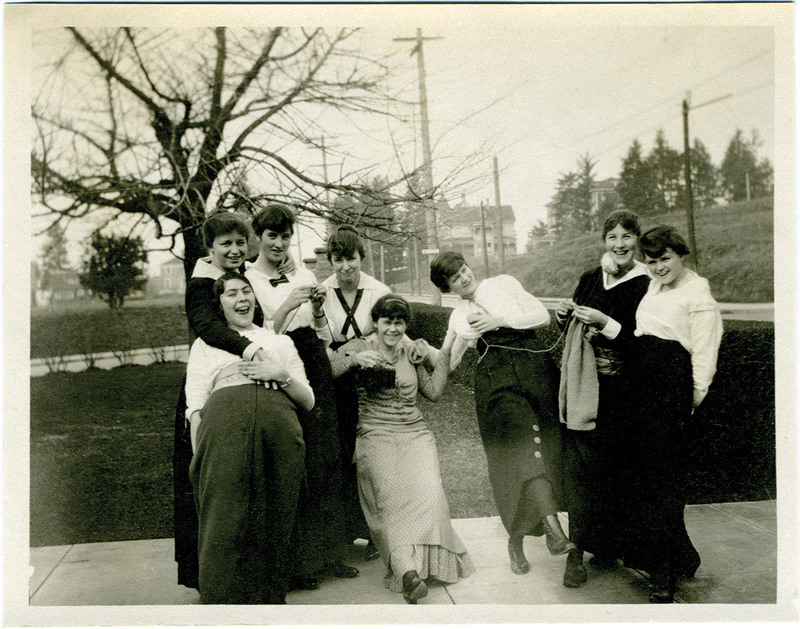 My problem lies in the short rows, the gusset and whatever else. These areas are always talked about, but for some reason, it ain’t gellin’. I figure if I keep following a pattern and keep trying, I’ll remember and one day it’s going to make sense – BOOYAH! LOL. How did you guys overcome any learning disabilities, crafts related or otherwise? So sturdy it stands on its own! moves way faster than knitting. But I love knitting, because I like what you can make with it. And I love the feel of the needles. However, I do have a schedule of projects, believe it or not, and knitting just didn’t show up in any of these. (Since then, I have modified that. You’ll see!) 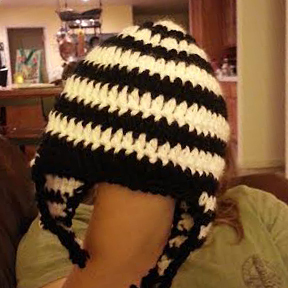 Anyway, with a relatively clear idea of what I wanted in mind, I started out making a hat. The yarn wasn’t exactly what I wanted, but we’d make it work. When I’m finished with the brim, I get a brilliant idea. Hey – why don’t we add some seed stitching for interest? Sure, why not? A few rows after that, I’m jonesing to try out my new cable needle/hook, and I think, Let’s throw some cables in here! Sure, why not? I can almost hear the knitters out there, sighing in dismay. Yea, yea. I did it. Good news, though. My husband adopted this very warm and still wearable cap because his job takes him over Donner Pass, and in the winter, at night, it’s brutal. Also, he’s alone so no one can see it LOL! Who else has fallen in love with the avocado sweater seen on this Subway commercial? Must have it! I am game for any pattern suggestions and would like to get a KAL going! 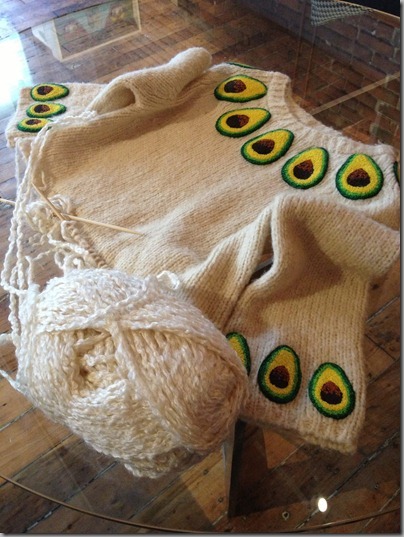 Are the avocados knit or crochet? Anyone? 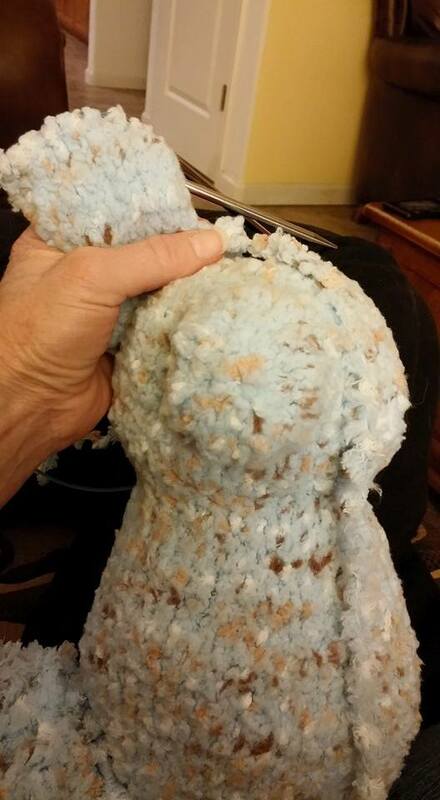 The placement of the needles would imply it’s knit from top down, but it looks like it could go both ways. Since I’m a fan of the bottom up method, I’ll be sticking with that. Any suggestions as to what stitch and type of yarn? I WANT TO HEAR FROM YOU…so I could ignore it and do what I want to anyway – LMAO!!! No, really, I’m open for suggestions here. Can you tell that my mother’s visit is over and I am once again my own person? Love my mom, but man, she can drive a person crazy. I know, I know, all daughters says this of their mothers, but other people say this of her also – it’s not just me. Oh, sigh. The burdens we must bear as humans. See you in the funny pages! So this is my third pair of socks, and each time, I learn something new. 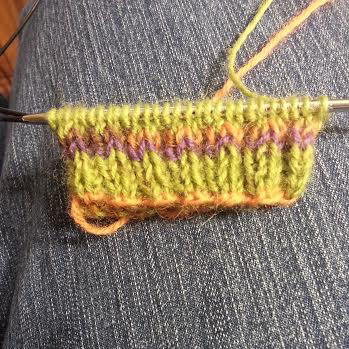 The pattern I follow is cuff down, which is fine by me, but I can’t stand the heel! And the longest part for me is after turning the heel, picking up stitches and sizing the instep, the one of the easiest parts which should be quickest – the race for the toe! That takes WAY longer than the rest of the sock, and I don’t know why! Once I hit the toe shaping, we’re done, but it could take me two days to get there from the heel – giggle! 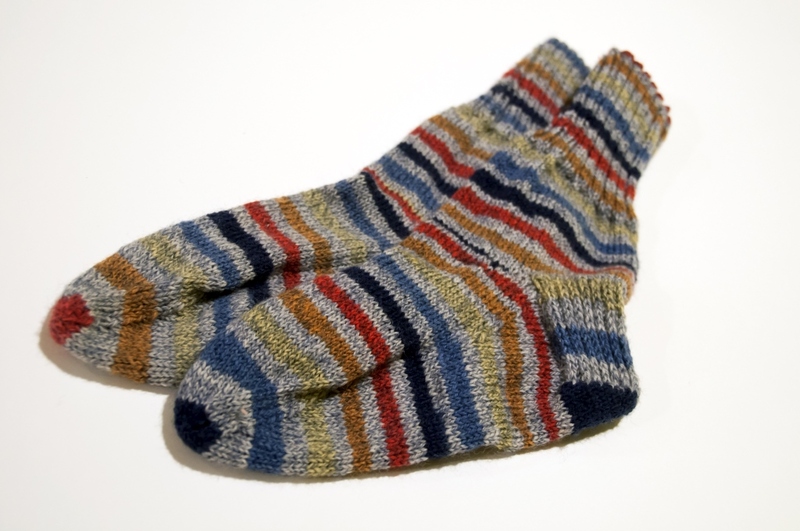 I must admit, I am in love with the self-striping yarn. It made my first forays into the wonderful world of sock knitting less painful. What did surprise me was the face that I actually preferred using dpn’s to the wonderful wonderful magic loop method. I am such a big proponent of this style of working in the round, it shocked me that I preferred the unwieldy needles. Eh – live and learn.